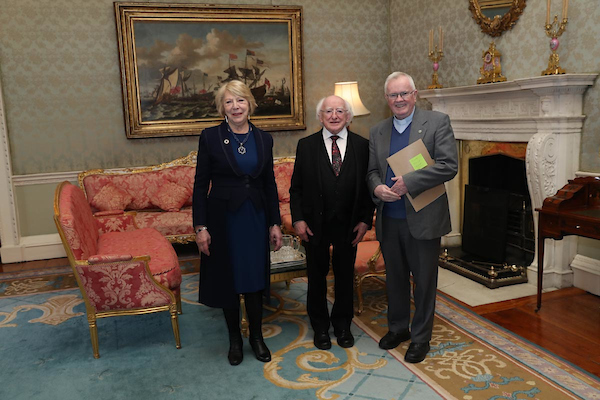 On Monday evening, March 26, 2018, President Michael D. Higgins and Mrs Sabina Higgins welcomed the Society of African Missions and many friends and associates to Aras an Uachtaráin for the inauguration of the SMA Laudato Tree Project. The inauguration, including a meeting with the Irish Government the following day, received extensive news coverage including the RTE Six-One Television News, the BBC World Service, the Irish Times, Irish Independent, the Times of London and a Press Association article published in scores of local and regional newspapers in Ireland, the UK and Europe. You may access a sample of the Press Association article by clicking here. The Laudato Tree Project is an extension of the SMA Thumbprint Campaign for Climate Justice and is an environmental initiative in Ireland that also aims to help transform the Sahel region of Africa. It is inspired by the environmental encyclical letter of Pope Francis, Laudato Sí, along with an epic African initiative, the growing of a Great Green Wall. The purpose of the wall is to halt the impact of desertification across the Sahel. Over the coming week we will share with our readers various aspects around this important initiative, including a major address by the Irish President; and an Op-Ed in the Irish Independent, published through the auspices of the SMA Communications Office, by Madam Monique Barbut, Executive Secretary, United Nations Convention to Combat Desertification, inviting Ireland to play a leading role in helping Africa to deliver THE GREAT GREEN WALL. The SMA project links the planting of trees in Ireland with increasing support for the planting of trees along the Sahel, and it will be developed in association with various environmental organizations throughout Ireland, as well as local and national government. It is part of the SMA Family Tree Programme through which the society will work with young people, families, parishes and community groups, in the lead up to the World Meeting of Families next August, which will be attended by Pope Francis. 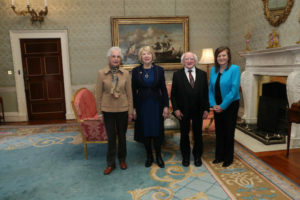 Addressing those present from various justice, religious and environmental groups, President Michael D Higgins spoke of Ireland’s role in combating desertification caused by global warming. He gave his firm backing for the Great Green Wall initiative and urged leaders to come forward in Ireland to develop the Laudato Tree project all across the country. 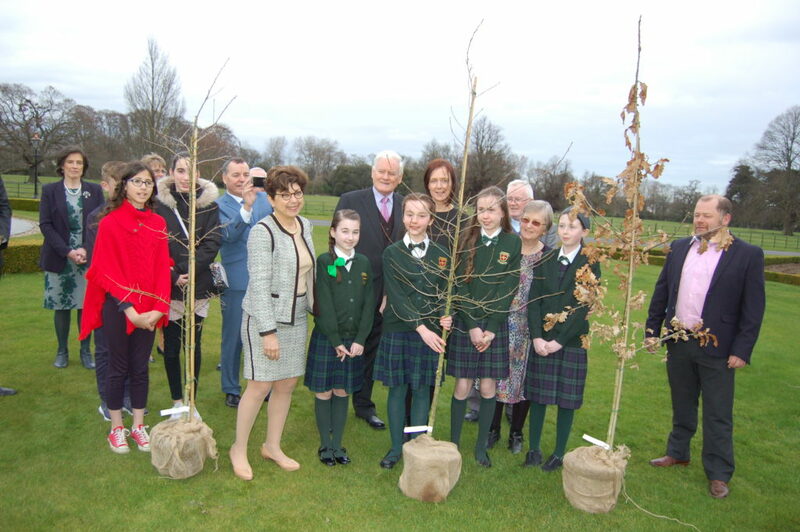 Madam Monique Barbut, Executive Secretary of the UNCCD, presents the first Laudato Trees to Irish school children involved in the SMA Thumbprint Campaign for Climate Justice. To the right is Mr. Peadar Collins, CRANN, who supplied the seedlings. Speaking in the Áras on behalf of the Society of African Missions, the Provincial, Fr. Michael McCabe, said the order believed that the project is an imaginative way to achieve the goals and commitments agreed in the Paris summit. Fr. McCabe’s address will be published on the SMA website in the coming days.